This poster really caught my eye. 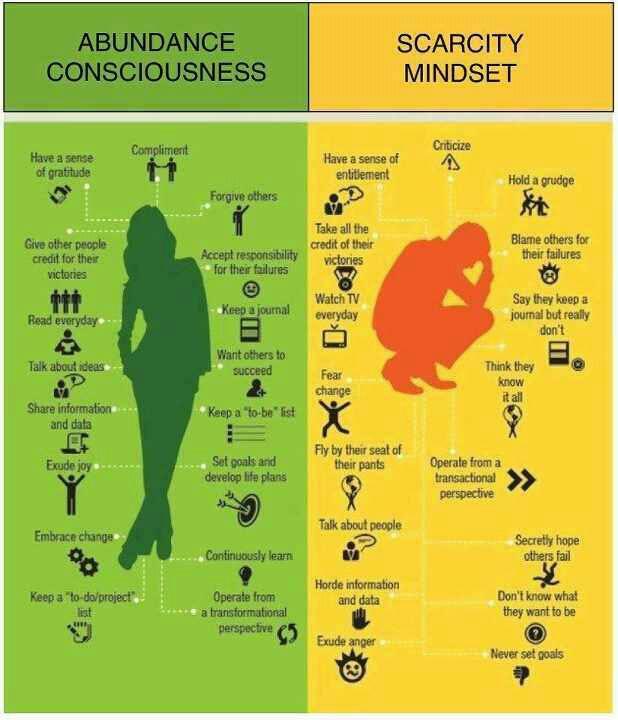 Your mindset determines how you view the world and what you expect to happen to you. This is very important to pay attention to – which one describes you? Do you realize each item on this list is a CHOICE? People tend to think of themselves as the victim of their circumstances or other people’s choices, but in reality we get to CHOOSE what to do with what life hands us. We can cry about how sour life is or we can make lemonade from the lemons we are handed. The choice is ours to make. Action step: Choose 1 item from the Scarcity mindset that sounds like you (there’s probably at least 1 that you fall into from time to time … or daily). Look for the opposite characteristic in the Abundance mindset. [There are more on the poster than just the ones I listed above. Pinch the screen to enlarge it.] Determine that from now on you will make a different CHOICE. You will choose to BE a different person … it’s all based on your choices, you know. You get to CHOOSE who you will BE – did you know that? No one can MAKE you be the person with the Scarcity mindset just as no one can MAKE you think like the Abundance mindset. It’s completely up to YOU. You get to CHOOSE who you will BE – did you know that? Go BE amazing!! I believe you can do it! !